The existing Forerunner 210 has been a huge success, but many of our customers, especially women have asked for more colorful units. 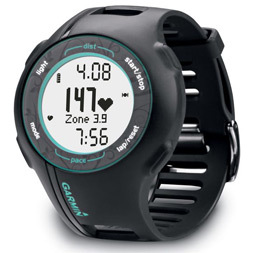 In response to this request, we are offering this new dark gray Forerunner 210HR with teal accents. 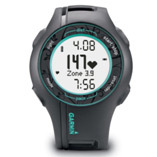 This easy-to-use GPS-enabled sport watch accurately records your time, pace, distance and calories burned. For runners who want more training capabilities, Forerunner 210HR lets you create customized interval sessions and see your pace for each interval. It also comes with our premium soft strap heart rate monitor and allows you to customize heart rate zones and alerts. Once your workout’s done, you can upload to Garmin Connect™ to analyze, store and share your data, see the route you traveled on a map and even create goals. Track every minute and every mile with the Forerunner 210HR.